Do you find yourself having too many calendars? There’s your work calendar, your family calendar, and maybe even a personal calendar. Even if you’ve got all of these calendars in electronic form, you can still find yourself in a situation where you need to check in multiple places to make sure you’re free. And with multiple places to look, mistakes are bound to happen. It’s pretty easy to bring all of your calendars together on any mobile phone, but it’s hard to see and plan from such a small screen. Depending on how strict your workplace is, it may be harder to bring all of your calendars together at work. I just started a job at a company that takes security around personal laptops very seriously. I can’t install any old app or plug in onto my computer. When it came to my calendar, this was leaving me very frustrated because I wasn’t allowed to add my personal account to Outlook. If you’re in the same boat, here’s how you can easily get around this problem. I’ve got a family calendar in Cozi. 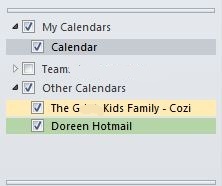 And a personal calendar in Hotmail (Outlook.com). In my case, as I was trying to coordinate my work schedule against something as simple as attending my son’s basketball game or making sure I left work on time for an evening school meeting, I had to check my work calendar, Cozi.com and Outlook.com. That was just too much for my brain to keep track of in 3 different views. We’re using Outlook at work. We happen to be using the 2010 version but what I’m about to describe also works in 2013 or Office 365. From most calendar programs, Google, Outlook.com, Cozi, you can share your calendar as a calendar “feed” or as a link. This generates a URL that you can use to access this “calendar feed”. 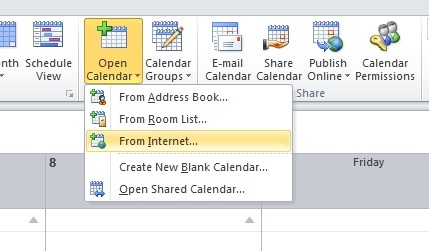 From inside Outlook, under the home tab, choose “Open Calendar”, then choose “From Internet”. After this, you’ll get a dialog box that lets you copy the URL you got from your other calendar program. Once you paste that in, that calendar will be added to your calendar list. In my case, I’ve got my personal calendar that I named “Doreen Hotmail” and my family calendar from Cozi. Now, you can see all of your calendars overlay-ed with one another. This helps you keep from double-booking yourself and helps you more easily manage family commitments against your work commitments. The best part is that you can keep your work calendar as the “active” calendar and the other calendars really appear to be sitting in the background, not distracting you but helping you avoid creating conflicts across work and home. Posted in Time Management.Tagged Calendar, Calendar Feed, Cozi, family, Hotmail, Outlook, Outlook.com, School Sports Schedule, working mom, workingparents.